7 days notice free of charge. Later than 7 days, customers will be charged 50% of the total price. 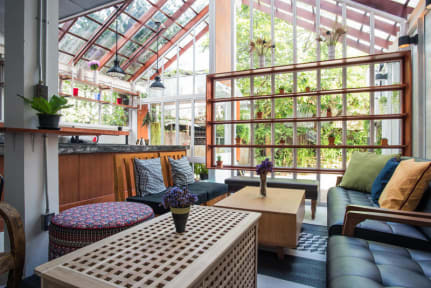 As natural as the light shine through the window pane, Haus Hotel brings the feeling of home with a touch local city experience that surrounds this cozy hostel. You can discover lounge areas all over Haus from the rooftop lounge, reading nooks, computer working areas and greenhouse lounge. Socializing made easy only at Haus. We've reinvented this historic house to suit all the needs of the new generation of travelers, offering shared accommodations. Each comfy bed comes with bed sheet, pillow, blanket, reading light, towel, shared baths, Air-con, and under bed lockers. We have power outlet for your charging needs. Our HAUS is a place for those who have respect for one another. All members of our local staff are delighted to advise our guests on itineraries, transport, restaurants, parties and anything else they might require. Sabai Sabai customer service you can only find at Haus. 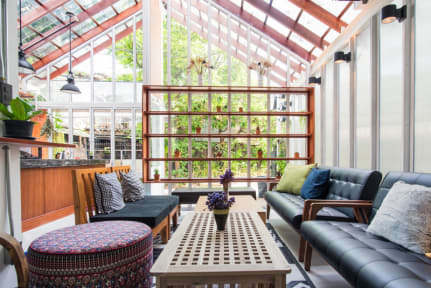 Leave your worries behind and go with the flow of Chiang Mai. 3. Age Restriction: The guests must be 18 - 35 years old of age. 8. Self-served breakfast is from 07:00 to 10:30. 9. No curfew but we kindly ask your cooperation to respect the common rights of your fellows including loud talking, personal items, simple rules at our HAUS and personal space. 10. Respect your neighbors and fellow travelers by lowering your voice after 22:00. One of the best hostels I've ever stayed at. It's the perfect balance between chill and fun. Staff was very helpful and friendly. Location is very good. The rooms are small but very clean and beds have curtains for privacy. There is a rooftop terrace where you can chill and socialize. Most nights, people would meet up there for drinks which was great. All in all, I definitely recommend this hostel!